Projects what are included in the solution. 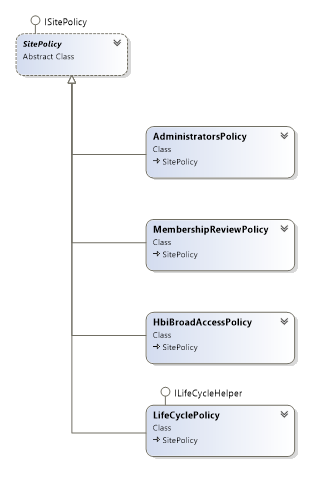 The data access layer for governance information records powered by Entity Framework 6. The SiteInformation entity class contains both SharePoint site status and additional governance status. The GovernanceDbRepository class provides methods to access SiteInformation records. A set of reusable abstract or concrete site management policies. This project contains a set of PnP timer jobs. It is responsible of the SPO site status synchronization and site policy enforcement / notification works. TenantManagementTimerJob is an abstract class inherits OfficeDevPnP.Core.Framework.TimerJobs, which is designed to be used as the base class of all tenant management related timer jobs. It outputs the current job progress to the console. SynchronizationJob is a concrete TenantManagementTimerJob which iterates thru all SharePoint site collections to keep the DB repository being up to date. 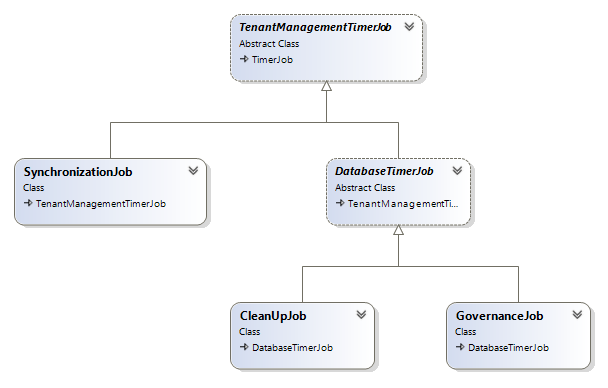 DatabaseTimerJob is an abstract class derived from TenantManagementTimerJob, it replaces the default SharePoint site resolving logic by providing a GovernanceDdContext for concrete classes to query the site information records from DB repository. CleanUpJob is a concrete DatabaseTimerJob. It steps thru each DB site record and deletes all out-dated ones of which the corresponding site collection has been deleted manually from SPO. GovernanceJob is a concrete DatabaseTimerJob. It queries all incompliant site collections from DB by using the NoncompliancePredictor property of all registered site policies and then run governance workflow. 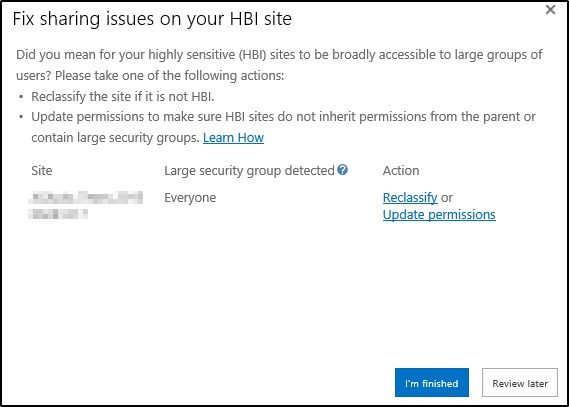 GovernancePreprocessJob is designed to support some special site policies (like HbiBroadAccessPolicy) which requires a customizable site scope query (check all HBI webs) as well as a complex DB status updates process. This is a sample console project to host the governance timer jobs, which maybe deployed to Azure or on-premises. TenantUrl: The SharePoint Online tenant URL, like "https://contoso.sharepoint.com"
User: Tenant Administrator's user name used by PnP core to iterate thru site collections. 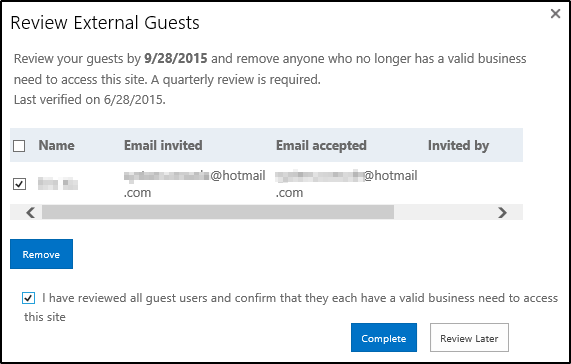 ClientId: A SharePoint App client id with tenant full control permission. Please reference the instruction at here to install the SPApp. For now, this governance solution only implements the backend part of works, which update the DB repository status and carry out the site policy enforcement workflow. However the full site lifecycle management also requires some UX components to be setup at site collection provisioning time, so that administrators could complete the remediation process before a site collection got locked up or deleted. Governance Solution should provide a page for administrators to either extend or decommission the site collection at the end of a default site life cycle. Governance Solution should provide a page for administrators to review each external users membership and update the last review date in DB repository once it's confirmed the review process is done. Governance Solution should provide a page for administrators to reclassify or update permissions for in-compliant sites. Governance Solution should provide a page for administrators to restore a locked up site collection back to its active status. The unlock page url should be assigned to the property Tenant.NoAccessRedirectUrl with related tenant CSOM API.